The U.S. ranked as the 18th-happiest country in the world in 2018, according to the World Happiness Report, released by the Sustainable Development Solutions Network for the U.N. That’s down four spots from the 2017 ranking. But while the U.S. may not be the happiest country in the world, there are some parts of the country that are doing exceptionally well. Thanks to factors like affordable homes, low unemployment rates and high life expectancy, some counties are happier than others. Below we look at these and other factors to rank the happiest places in America. In order to rank the happiest places, we compared counties across eight factors. Specifically we looked at unemployment rate, poverty rate, affordability ratio, marriage rate, divorce rate, bankruptcy rate, life expectancy, and physical activity rate. Check out our data and methodology below to see where we got our data and how we put it together. 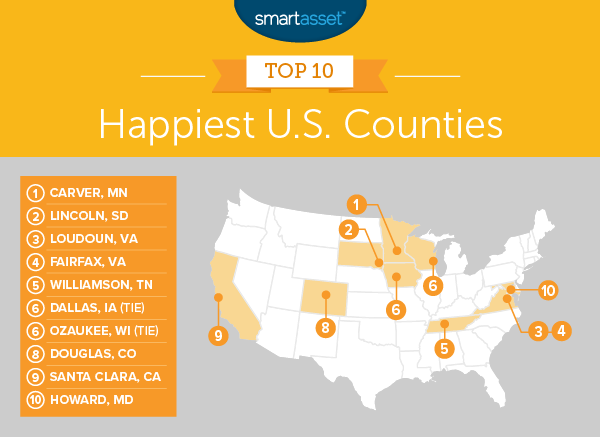 Consistent counties – In total five of last year’s 10 happiest counties scores in the top 10 this year. In particular Carver County, Minnesota and Loudon and Fairfax Counties in Virginia scored well, with each county securing a top 5 spot for the third straight year. A wide spread – No single state or region dominates the top 10. Nine states are represented in our top 10 and every geographic region is represented in our top 25. The Midwest has a slight edge with 9 counties representing it in our top 25. Georgia ranks poorly – Georgia counties make up five of the 10 least happy counties in our study. These counties tend to have high rates of poverty and unemployment. The worst-scoring Georgia county is Richmond County, which scores a 2.42 on our index. This is the 2018 version of this analysis. Check out the 2017 version here. Carver County, Minnesota is the happiest place in America in 2018, after finishing in the top 5 for the past three years. In particular this area is boosted up our ranks thanks to strong economic conditions. This area has an unemployment rate of only 3.1% and a poverty rate of only 4.1%. For poverty rate this county ranks in the top 5. It is also full of happy couples. According to our data, 62% of residents are married and only 8% of residents are divorced. In each of those metrics, Carver ranks in the top 40. Perhaps one of the most important keys to happiness is economic stability. In that metric, few counties score better than Lincoln County. This area has a poverty rate of only 3.7% and an unemployment rate under 3%. When it comes to cost of living, Lincoln also posts high scores. According to our data, the average household earns 2.1 times more than the minimum cost of living. For that metric, this county ranks 24th. Most residents here also live long into their retirement years. The average life expectancy here is just over 83. After finishing first and second in previous editions of this study, Loudoun County ranks third for 2018. What makes Loudon County residents so happy is the strong economic conditions in the region. This county has an unemployment rate under 3% and a poverty rate of 4%. For poverty rate, Loudon County ranks third. If Loudon wants to reclaim the top spot, this county will need to improve its bankruptcy rate. According to our data, it has the third-worst bankruptcy rate in the top 10. Another Virginia county, which continually ranks among the happiest in the nation is Fairfax. This suburban county of the nation’s capital boasts one of the highest incomes when compared to cost of living. According to our data, the average household earns nearly 2.3 times the minimum recommended amount to live a comfortable life. When it comes to life expectancy few places live longer than residents in Fairfax. Our data sources estimate that Fairfax residents have a life expectancy of 83.73 years. Williamson County is the first newcomer to the top 10. Last year this county finished 24th. Williamson is a suburb of Nashville and contains many happy residents. It has the highest income-to-cost-of-living ratio in our study and the second-highest marriage rate among its residents. One area where Williamson residents could improve their score in this ranking, and their overall health, is in their physical activity rates. According to our data, less than 80% of residents here get the recommended amount of physical activity, the second-worst score in our top 10. Dallas County is part of the Des Moines–West Des Moines, Iowa metro area and ranks well in economic and social metrics. According to data from the Bureau of Labor Statistics, this county has an unemployment rate of only 2.3%. That means there are plenty of jobs available in the area. Another metric in Dallas County’s favor is the high marriage rate. Around 62% of residents here have found life partners and only 8.9% of residents divorced. Ozaukee County is located within the Milwaukee-Waukesha-West Allis metro area and lies on the western coast of Lake Michigan. This county has solid scores across the board, ranking in the top 20 in four different metrics. In particular, Ozaukee has a low unemployment rate and a high marriage rate. In both of those metrics this county ranks in the top 20. If Ozaukee wants to claim a top 5 spot next year, it will need to improve its bankruptcy rate. The county ranks 338th in that metric. Few counties take physical activity more seriously than Douglas County residents. Nearly 90% of residents here get an adequate amount of physical activity. One reason residents here are so physically active is because of the access to state parks in the area. The Castlewood Canyon State Park, Chatfield State Park and Roxborough State Park all fall within Douglas County. But there is more than just nature in this county. Residents here also tend to do well economically. This county has the sixth-highest income-to-cost-of-living ratio and an unemployment rate of 2.8%. Santa Clara is the happiest county in California according to our research. Located near San Jose, this county has year-round nice weather to improve resident’s moods. Overall this county ranks well on our social metrics. Santa Clara has the seventh-highest life expectancy in the country and 84.5% of residents are physically active, a top 30 rate. However, due to relatively high costs of living, this county does have a poverty rate which could be improved upon. According to our data, Santa Clara has a poverty rate of 9.3%, the worst rate in our top 10. Howard County rounds out the top 10. Located in central Maryland, and part of the Baltimore-Columbia-Towson metro area, this county scores well in most of our economic metrics. In particular, this county has a low poverty rate and a high income-to-cost-of-living ratio. In each of those metrics, Howard ranks in the top 10. One concerning metric weighing Howard down in the rankings is its high bankruptcy rate. This county ranks 406th in bankruptcy rate, the lowest in our top 10. Unemployment rate. Data comes from the Bureau of Labor Statistics and is for January 2018. Poverty rate. Data comes from the 2016 5-Year American Community Survey. Ratio of income to cost of living. This is the median household income divided by required annual income before taxes to afford typical expenses for two adults and one child. Data on median household income comes from the Census Bureau’s 2016 5-Year American Community Survey. Data on required annual income comes from the MIT Living Wage Study. Marriage rate. Data on marriage rates comes from the Census Bureau’s 2016 5-Year American Community Survey. Divorce rate. Data on divorce rates comes from the Census Bureau’s 2016 5-Year American Community Survey. Personal bankruptcy rate. Data for personal bankruptcy filings came from uscourts.gov. Life expectancy rate. Data on average life expectancy rate comes from the Institute for Health Metrics and Evaluation and is for 2014. Physical activity rate. This is the percentage of adults age 20 and over reporting no leisure-time physical activity. First we ranked each county in each metric. Then we found the average ranking for each county. Using this average ranking, we created our final score. The county with the best average ranking received a 100. 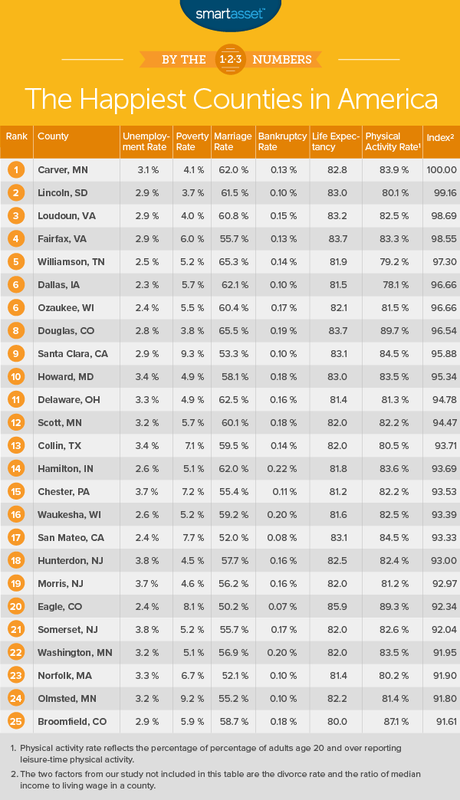 The county with the worst average ranking received a 0. Save before you are ready – The home-buying process is long. But one way to shorten it is to start saving for your down payment before you are truly ready to buy a home. In some cities we estimate it would take the average worker over 10 years to save for a down payment. Do all the math – The largest cost of owning a home is the mortgage. 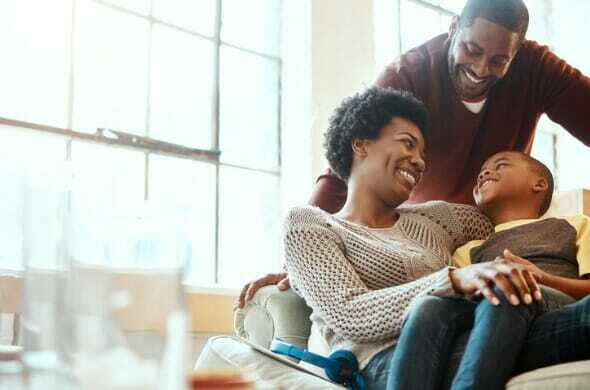 But many homeowners, especially first-time homeowners may be surprised at how much they end up paying in property taxes. For example in Loudon County, Virginia property taxes cost 0.797% of assessed home value. That means homeowners in Loudon with a $500,000 home will pay $4,000 per year in property taxes. Stay patient – Another mistake people make it getting too attached to a specific home. Even if you believe you are bidding on your perfect dream home, it is not a good idea to buy it if the price exceeds your budget. By buying a home you can’t afford, even your dream home, you run the risk of having to sell it for a loss if you can’t afford the payments. Especially when you factor in the months of saving, time spent looking and closing costs making a mistake when buying a home can be expensive.